Axio is a game by Reiner Knizia. In this game players play one of their tiles on the board with the objective to establish lines of matching symbols emerging from the placed tile. Players must attempt to score in all six of their colors, not leaving any one of them behind. When the board is filled, the lowest color score of each player defines his result. The player with the highest result wins. Below the board when the game start. In total this game has 120 tiles (90 tiles with 2 different symbols and 30 tiles with 2 of the same symbols). At game start each player gets 6 random tiles, those tiles can only be seen by hime. 1. Play 1 tile: Choose one tile (top) and place it on any two connected empty spaces on the board. Click (multiple times) on one of the top tiles to rotate it. In the first round, each player must play adjacent to a different one of the six symbols already on the board. Tip: the position a tile is placed depends on the symbol with the blue border. 2. Score the tile: Start with one of the two symbols on the tile that has been placed. There are five lines emerging from this symbol, as indicated below. In each line count the number of identical symbols, but stop counting as soon as you come to an empty space or a different symbol (do not count the symbol on the tile you just played). The total count makes your score in this symbol. Then the second symbol on the tile you played is scored in a similar matter. 3. Refresh your hand: You get new random tiles so you again have 6 tiles in hand. 4. Swap tiles: Before your hand is refreshed, if your hand does not contain any of the color(s) currently in lowest position on your score, then you may swap all your tiles. We will randomly draw 6 new tiles for you. You cannot score more than 18 points per color. 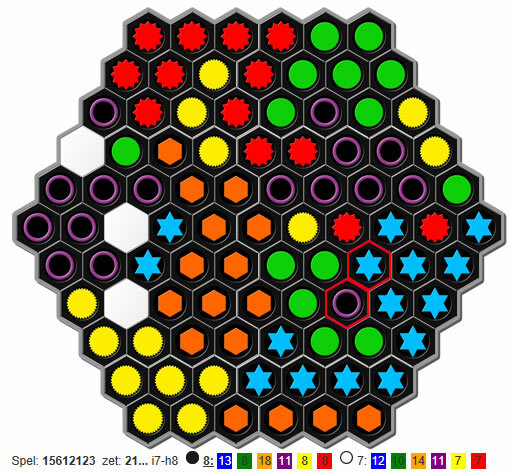 For each of the colors that reaches a score of 18, you get an instant bonus play of one tile. Your hand is only refreshed after completing all bonus plays. The game ends when no further tiles can be played. The lowest color score per player is determined. This color is the score of that player. The player with the best score wins. In the case of a tie, the next lowest color is used as a tiebreaker, and so on. In the very rare case that one player succeeds in scoring 18 points for all 6 colors, he wins instantly. In the game below black has won the game with a score of 8 against a score of 7 for white.